In addition to their applications in genome editing and gene expression regulation, programmable DNA recognition systems, including both CRISPR and TALE, have been recently engineered for the visualization of endogenous genomic elements in living cells. 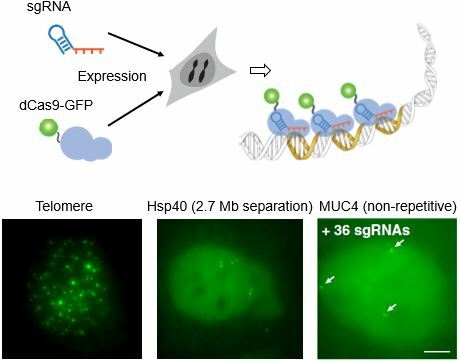 This capability greatly helps the study of genome function regulation by its physical organization and interaction with other nuclear structures. Please see our Methods in Enzymology book chapter for a detailed protocol to use the CRISPR/Cas9 system to label and image specific genomic loci, including the establishment of expression systems for dCas9-GFP and sgRNA, the procedure to label repetitive sequences of telomeres and protein-coding genes, the simultaneous expression of many sgRNAs to label a non-repetitive locus, and the verification of signal specificity by FISH. Chen, B., Gilbert, L.A., Cimini, B.A., Schnitzbauer, J., Zhang, W., Li, G.W., Park, J., Blackburn, E.H., Weissman, J.S., Qi, L.S., and Huang B. (2013). Dynamic imaging of genomic loci in living human cells by an optimized CRISPR/Cas system. Cell 155, 1479-1491. Ma, H., Reyes-Gutierrez, P., and Pederson, T. (2013). Visualization of repetitive DNA sequences in human chromosomes with transcription activator-like effectors. PNAS 110, 21048-21053. Miyanari, Y., Ziegler-Birling, C., and Torres-Padilla, M.E. (2013). Live visualization of chromatin dynamics with fluorescent TALEs. Nat Struct Mol Biol. Yuan, K., Shermoen, A.W., and O'Farrell, P.H. (2014). Illuminating DNA replication during Drosophila development using TALE-lights. Current biology : CB 24, R144-145. Anton, T., Bultmann, S., Leonhardt, H., and Markaki, Y. (2014). Visualization of specific DNA sequences in living mouse embryonic stem cells with a programmable fluorescent CRISPR/Cas system. Nucleus 5, 163-172.